On Friday this week my mom and I spent the morning painting the outbuildings on their property to match the new house colour. There wasn’t a lot of stain left, and we used up the last of it without finishing the first coat. Since we were going to need another can, and we had a few other errands to run in town, the two of us made a trip out in the afternoon. We took the backroads home from town, a route I don’t often have occasion to travel anymore, since ordinarily I’m taking the major highways between my home and my parents’. It was nice to see some of this countryside that I haven’t been through in a while. Along that road there’s a number of wet spots where these giant plants grow. 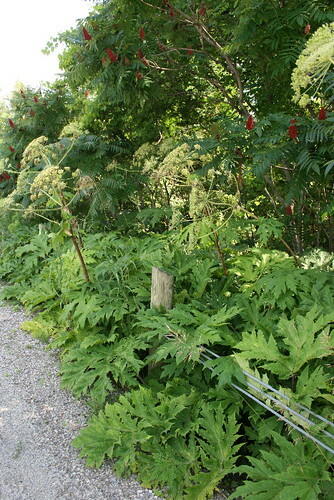 The stuff is called Giant Hogweed (Heracleum mantegazzianum) and is – you guessed it – an invasive species. 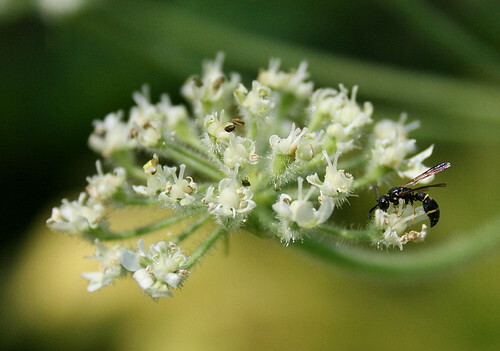 It’s related to our native Cow Parsnip (H. maximumin), and is in the same family (Apiaceae) as the also-introduced but much more frequently encountered Queen Anne’s Lace, among others. It bears some resemblance to the wild carrot of roadsides and pastures, with broad, spreading flower heads and deeply incised leaves. However, it grows to be three to four times larger, reaching on average 2-5 meters (6-16 feet) high, with some extraordinary individual plants as tall as 7 m (23 ft). 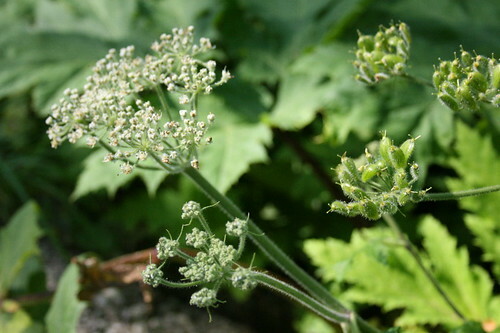 The flower stalks are all a reddish-purple colour that helps distinguish the species from other similar-looking plants such as Cow Parsley or Water Hemlock (neither of which grow as tall as the hogweed). The plants were all mostly finished blooming by this time of year, but can be quite a roadside spectacle when they’re all in bloom, the many clustered plants, with their giant white umbrellas, looking like congregations of oversized Queen Anne’s Lace. Later in the summer, once they’re done blooming, they develop large seed pods, each the size of a pumpkin seed. A single, large plant can produce as many as 100,000 of the things. This was the stage most of the plants were in when we stopped to check them out. My mom, who has more opportunity to travel that way, living in the area as she does, watched as they grew, bloomed, and started growing seeds. I just caught the end of the show. The plants only flower in their second or third year, so these have been present for a while. The patch had started out some years ago not that large, but has spread out into the surrounding wet areas. This particular area of hogweed now lined both sides of the road and extended into the wet forest a short distance, as well as lining the edges of the cattail stand. You can see some distance patches on the far side of the cattails in this photo. It is an aggressive weed, choking out the native vegetation without much difficulty, aided in large part by its size. The individually biennial plants also grow from a perennial tuberous root system, such that once it’s expanded into an area it’s not likely to relinquish it again without intervention. The species is native to central Asia, but was introduced to Britain and France in the 19th century, primarily as a garden ornamental, and is now found through many European countries. It was probably brought to North America not long after for the same reason. Since then it’s escaped the gardens it was planted in and is now found throughout wet areas in much of the northeastern and northwestern regions of North America. In Ontario it’s found through many localities in the south of the province, now occurring as far north as Haliburton county. 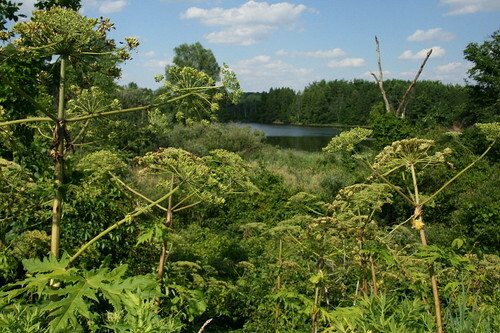 Giant Hogweed prefers wet areas such as riverbanks and marsh edges, but ditches are also a perfectly acceptable habitat. Given the disturbed nature of roadside ditches, sturdy plants such as this are a natural to settle in, and it doesn’t take them long to spread out into other areas from there. Along this stretch, the giant leaves of the huge plants nearly envelop the guardrails from view. You can easily see how such a species could begin to crowd riverside walking trails or boardwalks, if given a chance. With most plants this wouldn’t be a problem. 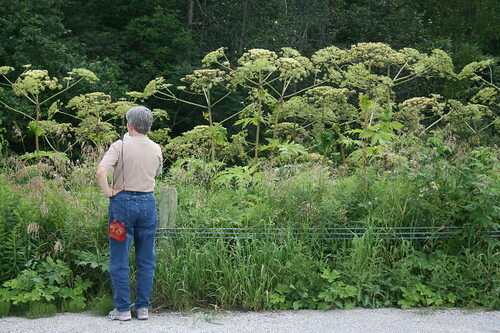 However, Giant Hogweed (and in fact all members of the genus Heracleum, including Cow Parsnip) contains a chemical that is as dangerous to encounter as that of Poison Ivy. The sap, and all of the oils that coat the surfaces of leaves and stem, contains a type of compound called furanocoumarin. Whether or not you can pronounce the stuff, it will still create an extremely adverse reaction with your skin. Brushing up against the leaves or stem of the plant will result in the oils being spread across your skin, much like touching Poison Ivy does. 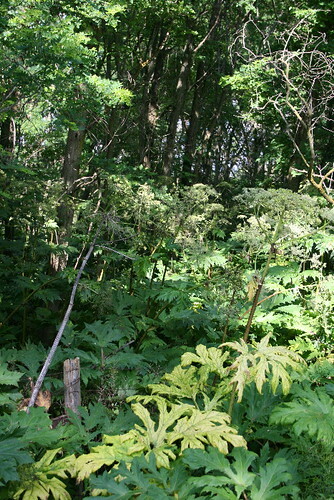 The reaction it produces is different, however; the oil of Giant Hogweed doesn’t create an allergic reaction the way Poison Ivy does, but is rather a phototoxic plant. This means that getting the oil on your skin will make your skin extremely susceptible to burning upon exposure to UV rays such as sunlight. It’s sort of the opposite of sunblock, enhancing the effects of the UV rays instead of reducing them. It takes 10 minutes for the oils of the plant to set in to your skin, but after that any exposure to UV light will cause the skin to redden and itch, and subsequently blister like a bad sunburn (which is effectively what it is). The burns will usually become purple or blackish scars, persisting for potentially several years. If you can remain inside, or completely covered up and protected from any UV rays, you’ll be fine, no reaction will occur. Wash the area with soap and water and try to remain protected for several days before going back out in the sun. Getting the oil or smoke from the plant in one’s eyes, however, can cause temporary or permanent blindness. Like with Poison Ivy, the effects of the oils seem to be contained to just a small group of animals. The insects appeared to be unaffected. We found a small plant at the edge of the road that was still blooming, and being visited by small wasps. As with the common Queen Anne’s Lace of the meadows, the flowers of the Giant Hogweed will attract local native pollinators. Wikipedia notes that its introduction to France was “much appreciated by beekeepers.” The flower heads can often be heavily infested with aphids, but I didn’t happen to notice any while we were there (though I admit I wasn’t specifically looking). There are control programs in place in some areas to try to manage this invasive plant, but methods are complicated by the danger of touching or inhaling its oils. If well-protected with full skin and eye coverage, it is possible to physically cut down the flower stems and broad leaves. This weakens the tubers (which can be as deep as 60 cm, or 2 ft), making them easier to pull up and destroy successfully. However, probably more effective, and certainly more efficient, if a bit less environmentally friendly, is the application of herbicides to the plants. Even once the plants themselves are removed, however, the seeds that the plant has dropped can persist and germinate for up to 15 years later. 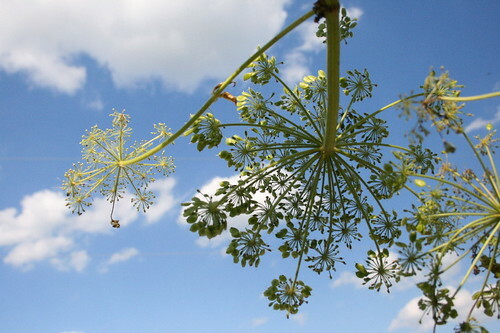 The Apiaceae family contains quite a number of unpleasant plants. 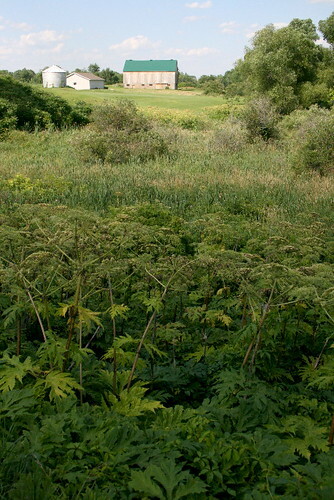 Besides the invasive hogweed, there’s also Water Hemlock, native to North America, and Poison Hemlock, native to Europe, that are extremely poisonous, with ingestion of the plant in even a small amount causing death within as little as 15 minutes. The latter was the hemlock that was given to Socrates (not related to the hemlock tree, which is what most people likely associate with the name hemlock). On the other hand, quite a lot of the family’s members are also commonly eaten – including carrot, parsley, celery and parsnip, just to name a few. I wonder how many people it took to figure out which was which? Interesting. I watched these plants grow in abundance along the Grand River last year. I looked them up and thought they were Angelica. I am glad to have the truth about them and the information on the potential for dermatitis. I pull up any Himalayan Balsam I see growing near the river, but I won’t try with this plant. Never heard of it; won’t forget it! I’m so used to plants around here being harmless to touch, except for a few like poison ivy and stinging nettle. As much I as dislike invasives, they are quite attractive plants. I love the composition of photo #5. “…more efficient, if a bit less environmentally friendly, is the application of herbicides…” I take a longer term view of “environmentally friendly”. Yes, the short-term impact of herbicide applications on native plants growing within the invasive stand is severe, but their populations over the long-term certainly benefit by the reclamation of available habitat it allows. Many a landscape renovation owes its success to an intial Roundup burndown or two. LavenderBay and Ruth, it’s true we’re used to the northeast as being a relatively harmless corner of the continent, certainly where we are in Ontario. I hadn’t any idea about the extent of these either, and it was good to learn! I agree with that point of view, Ted. I suppose I tend to think of a more ecosystem-wide view, in terms of runoff and water pollution and such, but certainly the long-term local effects of using it would be very beneficial for native plants. Yoiks, what a post. Thank you for all this. You probably could have stretched this out into Hogweed Week…I recall an anecdote way back in my plant ecology class about kids who were turning up with black rings around their eyes, very mysterious. Apparently they were making telescopes out of the stems of giant hogweed (newly introduced) and getting marks from using them! That’s the problem, Julie – so many of these topics have so much interesting information, it’s really hard to boil it down to a reasonably-lengthed post. But there’s so much interesting stuff out there, you miss out on other stuff if you spend more than one post on a subject. What to do? That’s an amusing story about the kids making telescopes of it, that probably wouldn’t have occurred to me as a potential problem.